Immersive technology is increasingly becoming the focus of not only experimental tech start-ups, but equally multinational corporations, with a wide scope of diverse applications and use cases. This scale of technological disruption has now begun to turn the heads of governments, politicians and regulators in the UK, the EU and worldwide. Haptics, that can recreate the sense of touch and thus immerse a user even further. 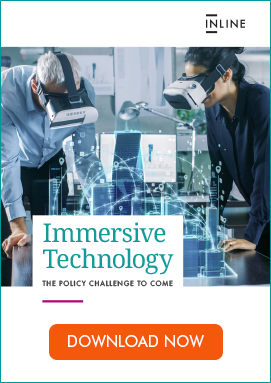 While the breadth and range of immersive technology forms and applications means that each company will have slightly unique issues to consider, the core nature of immersive technology will present three key battlegrounds in the coming months and years: content regulation, ethical data management, and rights and responsibilities. You can read more about these in our report here. If you are interested in talking to us about these issues and how we can help your business navigate the emerging political and regulatory landscape, please get in touch. You can subscribe to our notification emails to be kept up to date on any new political developments that impact the immersive technology industry.